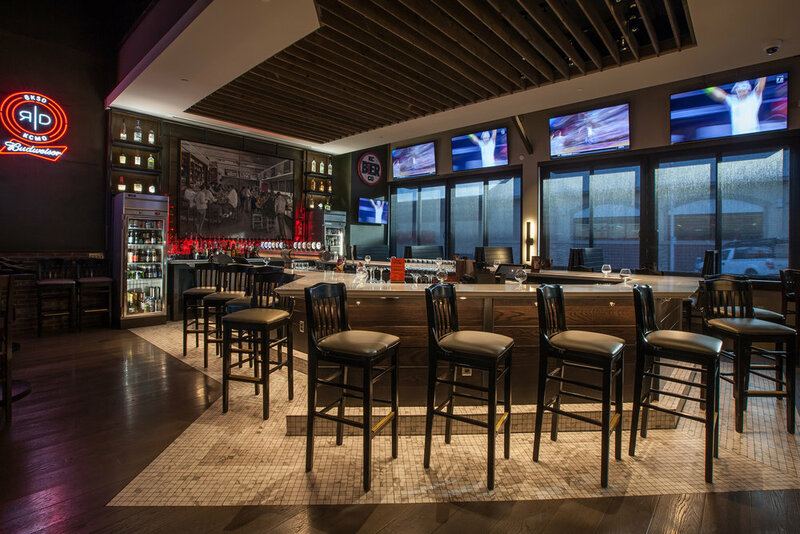 “Upscale neighborhood joint” may sound like a conflicted phrase, but for Red Door Grill it is the perfect message to describe the simultaneous sophistication and approachability of the brand. The brand and message found a natural fit in a brick masonry building, formerly home to a dry cleaner and restaurant, in KC’s beloved Brookside neighborhood. Just enough of these spaces were removed to reveal the building’s grand volume, set against the honest textures of original plaster, clay tile, massive steel structure, and wood framing of the original construction. The “U” shaped bar at the Red Door’s front parallels the pedestrian-oriented street behind an inviting storefront of glass, steel, reclaimed wood, and big red neon. Beyond the bar the intimately scaled and lit dining room is in conversation with the open kitchen opposite, reinforcing the restaurant’s approachability. The reclaimed and over-scaled front door -painted red of course- opens onto the wood fired grill at the entry setting the stage for incredible food to come.